Over the summer I read the entire Harry Potter series. (Previously, I’d just read the first book, and watched all the movies.) I also read some fan fiction (quite a lot of fanfic, actually), and some non-fiction books on the craft of writing. I’m not going to talk about either of those two things any more in this blog post, but I will be making a separate post about the Writing Guides, later in the week. Currently, I’m 83% through my personal Goodreads writing challenge for the year. That’s four books ahead of where I should be (33 out of 40 books down), and I’m quite impressed with that. I’ve said before that I only really started reading when I went to university (2007). I’m dyslexic, and I take my time, but my time has been paying off. In 2012 I set myself the goal of reading 25 books, and I smashed it, reading a total of 32 that year. 2013, I set my target for 30 books, and I ended up reading 34. Then, in 2014, my goal was 35, and I finished 39 books. So, it’s all going well. But let’s get back to this year. 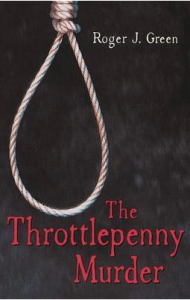 I’m currently halfway through The Trottlepenny Murder, a YA book set in 1885 about a thirteen year old girl set to hang for supposedly killing her miserly employer. It’s one my boyfriend gave me, from his school days, and I’m enjoying it. I also read a few poetry books, My Sister’s Keeper by Jody Picoult, and a book of short stories by Edgar Allen Poe. My plan is to read P.S. I Love You, next, but we’ll see how that goes. I’ll make another reading update, next month. In the meantime, you can follow me on Goodreads, here. Anyone Can Write a Book, eh? I’ve been both thinking about, and discussing this belief that anyone can write a book a fair amount recently, and I thought I’d share some of conclusions I’ve came to regarding it. You may not agree with my conclusions, but I do ask that you hear me out and read until the end before voicing any objections. So, this idea that anyone can write is a bit of an inside joke between authors, and with good reason. It’s actually written on the bathroom wall in Edinburgh’s Writing Museum and this amused me so much I had to capture it (see photo). You’d be amazed how often we hear “anyone can write a book” in a dismissive and/or patronizing way. But what most people, who haven’t even attempted a book, don’t realize is how much effort it actually takes; how many hours we can spend on a draft only to have to redraft it again afterwards. We don’t really know how to respond to the comment other than with a look that could clean corn BUT in a sense, they’re right, anyone CAN write a book – in a sense. Anyone can write a book, but that doesn’t mean it would be a good book, let alone publishable. Writing a book and writing a book that will sell are two different things, after all. I’d also like to point out that, while anyone can write a book, not everyone can write a novel. Unfortunately, this is what people actually mean when they say anyone can write a book. And it’s simply not true. If you can speak, form sentences, express yourself on a basic level, then technically all you’d have to do is record yourself talking about a specific topic at length and then transcribe this to form a manuscript. If you did this you would indeed have a book, but the chances of anyone reading it are very low and novels are different ball game all together; they take a different skill. You need to have the talent of a storyteller (and then some!). 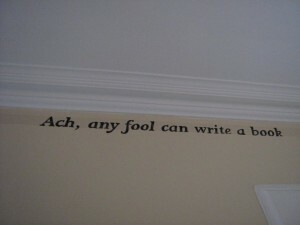 My last word on this is the following: You can write a book? 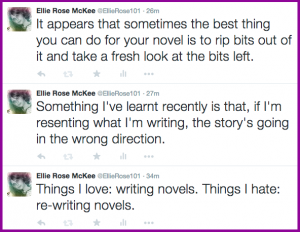 Writing a novel is easy? Prove it. Go on, I dare you. I’ve made YouTube videos on and off for years, on a few different channels. And I’ve deleted all of those videos, and those channels, again sooner or later. Never really found my groove with it. The thing is, I like making videos – like filming things, and editing them, but I don’t enjoy being in front of the camera. I think that’s been my downfall, so far. All that said, I have recently relaunched my new and improved YouTube Channel. So far it has a trailer (as shown below), clips from my Book Launch, and me reading a poem at a local event. We’ll see how it goes. Six Thirty-Six AM. I’ve been up all night again, urging myself to work on the never-ending rewrites of my novel and resenting every moment of it. I do this a lot and it’s now beyond a joke. Well, as Joyce Summers once said, it ends now. I’ve found the problem and, spoiler alert, it’s me: I’m flogging a dead horse. As much as I’m loath to admit it, parts of the story were simply dead. The plot was weak and lifeless in places and, now I’ve stopped trying to wrestle life into them, over the course of multiple mind-numbing re-writes, Writing is enjoyable again. Huzzah! Anyway, I guess the purpose of this post is just to document my breakthrough. If you’ve had similar issues, feel free to tell me about it in the comment section. *When I say ripped out, what I mean is that I’ve removed them from the Word document, and placed them in a completely different one. They shall remain there, in the scrap folder, probably until the novel is complete and I am 100% sure I don’t want/need to go through them one last time. I’ve been informed this is the right way to go about such things. “Gonna… gonna need a, a minute,” he said, laboring for breath. What was before her eyes finally sank in. Blood – he was covered in it. Winded himself?! He looks like death! And now it’s my turn to nominate seven other people. I pick: Erin Burnett, Valerie Christie, Gerry McCullough, Anna Sheehan, Cathy Reilly, A. Griffin, and James McKay. Following up on my last blog post, I can now tell you that not only will my work be in the exhibition, starting Thursday, but I’ve been asked to read at the event, too. And, if that’s not enough, I’ve also been told there’ll be a photo-op with the Mayor. Exciting times! This has really come out of knowing the organizers. In previous years I considered entering a poem but, in the end, I shied away. This year, however, I was greatly encouraged, and it’s made all the difference. On that note: I went to the local poetry recital I blogged about, as planned, and I’ve decided to enter the FSNI competition after all. My partner has been telling me I need to push myself/self promote more, and I have to admit that I think he’s right. Even if I don’t come anywhere near winning either of the competitions, I’m already glad I entered. Even if my artwork doesn’t sell, I’ll have still made it, and I’ll be able to keep it and show people. This week, and going forward, I’m feeling positive. If there’s something I want to do, I’m going to go for it. Who knows where it will lead me? For some reason, and not that I’m complaining, my life has had rather a lot more poetry in it than usual. I’ve recently finished reading two poetry books (By the Roadside, by S. J. McConnell; and Lords of the Hill, by Amos Greig) and am about to start a third (The Night is Darkening Around Me, by Emily Brontë). In addition to that, I’m off out to the Belfast Heat of the All Ireland Poetry Slam later tonight (not competing myself, this time). And on Monday, I’m planning to attend a local recital of poetry as part of the FSNI Competition series of events (but, again, going just to listen. Not competing in this, this year). One thing I am competing in, however, is the Third Annual Bangor Poetry Competition. 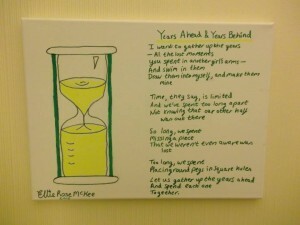 As such, I’ll have an illustrated art canvas with my poem on it (pictured), on display and available to buy at the Blackberry Path Art Studios. The launch event for this (which I will, of course, also be attending) is on Thursday, September 10th. To anyone in the local area, it looks set to be a great evening. Wine, poetry, art, and live music, all for free! More info here. P.S. Did you see the poem I posted on this blog, just last week?